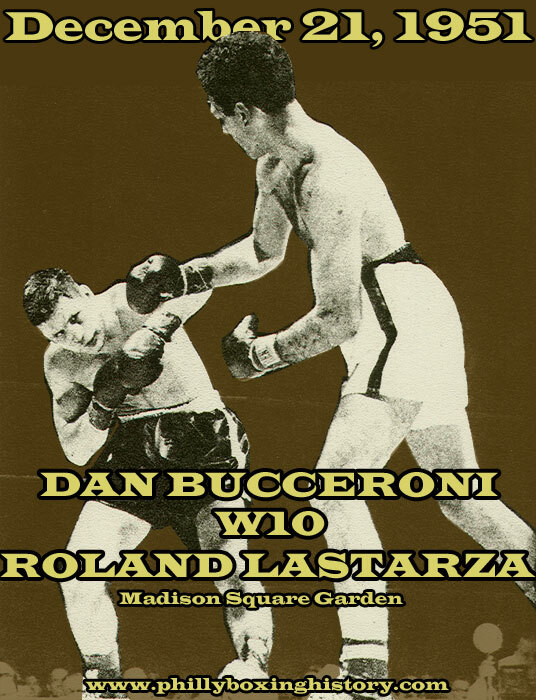 On this day in 1951, South Philly's Dan Bucceroni, a.k.a. the Butcher Boy, made the second of six trips to Madison Square Garden, and beat tough Roland LaStarza by 10-round decision. It was one of Dan's career-best wins, if not the very best. Bucceroni would fight on for another two years, becoming the #3 contender for Marciano's crown in '53. But his chance for a title never came. He retired in 1954 after three straight loses. His overall record was 46-6 (30 KO). In retirement he managed fighters and sold a popular boxing "how-to" book.